Five NOAA National Marine Sanctuaries on the west coast are vulnerable to harmful algal blooms, including blooms of Pseudo-nitzschia, which at times produce domoic acid – a potent neurotoxin that can accumulate in many animals. Consumption of toxic prey leads to illness and death in a variety of birds and marine mammals and necessitates shellfish harvesting closures to protect human health. The wide variety of habitats found within the Monterey Bay National Marine Sanctuary (wetlands, beaches, kelp forests, and deep canyons) support a diversity of life unrivaled in the world’s oceans. 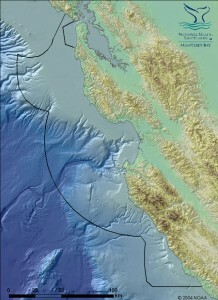 Credit: NOAA’s Monterey Bay National Marine Sanctuary. The Monterey Bay National Marine Sanctuary has a growing concern about harmful algal blooms and their impact on the sanctuary’s water quality. Recently, the sanctuary reached out to scientists who are comparing coastal harmful algal bloom “hot spots” in central and southern California, a study funded by NCCOS’s Ecology and Oceanography of Harmful Algal Blooms (ECOHAB) Program. The sanctuary is interested in whether land-derived nutrients are influencing the recent rise in blooms and domoic acid toxicity and what the sanctuary can do to help reduce nutrient pollution. Sanctuary staff are especially alarmed by the health risks these blooms pose for sea otters, sea lions, and whales. Following consultation with a project scientist, the Monterey Bay National Marine Sanctuary is now looking forward to the development of harmful algal bloom forecasts, partially funded by the NCCOS ECOHAB project. The sanctuary is also eager to engage their stakeholders in discussions about fertilizer use on nearby golf courses (e.g., Pebble Beach) and the generally large inputs from agricultural zones in order to curb or alter this usage. The ECOHAB “hot spots” project is determining the role of natural and anthropogenic nutrient sources (particularly anthropogenic nitrogen compounds such as urea and ammonium) on harmful algal blooms and their toxicity, which are often influenced by runoff pulses. The Monterey Bay National Marine Sanctuary has connections to many citizen groups who help foster interest in the project’s outcomes and improve crowdsourcing of citizen science observations of marine mammal strandings.